Actikem and Reed make it an EGGSTRA Special Easter! Reed Recruitment in Warrington have come up with a CRACKING idea to make it an EGGSTRA-ordinary Easter for the Children’s Ward at Warrington Hospital! 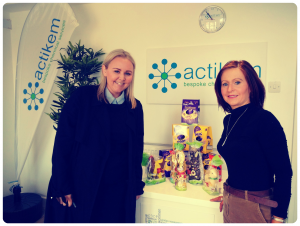 Working in partnership with a number of local companies, Hayley Denson and her team at Reed Specialist Recruitment, Warrington co-ordinated a collection of Easter eggs donated by local businesses. Hayley and her team will be delivering the Easter eggs on the 13th April to the Children’s Ward at Warrington Hospital. The hospital has a dedicated Children’s Ward and Paediatric A&E. The area is staffed by specially trained doctors and nurses skilled at looking after children. There is a playroom, teenager’s room and other facilities designed to make the stay on the ward as comfortable as possible for the younger patients. Reed are a global specialist recruitment company. Should you have any recruitment requirements, please contact Hayley Denson, Team Manager, Email: Hayley.Denson@reedglobal.com, Tel: 01925 414 222, Reed Warrington, Bank Quay House, Sankey Street, Warrington, WA1 1NN.